The pattern is similar in the Senate: 29 of the 56 women who have ever served in the Senate (including the incoming new members) took office in 2000 or later. Most Americans favor seeing more women in such jobs, according to a recent Pew Research Center survey: 59% of adults say there are too few women in high political offices. Women are far more likely than men to say that’s the case; so are Democrats and Democratic-leaning independents when compared with Republicans and GOP leaners. There’s less consensus, however, on what the real-world impact would be of more women serving in Congress, with divisions of opinion again by gender and party. In the same Pew Research Center survey, for example, 46% of women said Congress would do a better job of dealing with the country’s problems if more women were elected, but only 30% of men said so. And while 55% of Democrats and those who lean Democratic said a Congress with more female members would do a better job of dealing with the country’s problems, only 18% of Republicans and Republican leaners said that would be the case. The 19th Amendment, which extended the franchise to women across the nation, was ratified in 1920. That November, Alice Mary Robertson of Oklahoma became the first woman to defeat an incumbent congressman. (She lost the seat back to him two years later.) In 1922, veteran suffragist Rebecca Latimer Felton of Georgia was appointed to fill a vacant Senate seat; when Congress was unexpectedly called back into session, Felton was sworn in as the first-ever female senator, though she only served for a day. While women remained scarce in the Senate well into the 1980s, their numbers gradually, though not consistently, increased in the House – generally paralleling the expansion of women’s roles in society more broadly. In 1928, seven women were elected to the 71st Congress, a record at the time, and two more joined them later via special election. But that trend plateaued during the Great Depression and World War II. It wasn’t until after the war that the upward trajectory of women in Congress resumed, with 18 women serving in the House in 1961-62. Although the 1970s saw prominent figures such as Barbara Jordan, Elizabeth Holtzman and Bella Abzug enter Congress, women’s overall numbers didn’t change much until 1981, when their House caucus exceeded 20 members for the first time. The big jump, however, came in 1992 (later dubbed “The Year of the Woman”) when four new female senators and 24 new congresswomen were elected. Academics have offered various explanations for why 1992 was such a breakthrough year for women in Congress, including an unusually large number of open seats due to redistricting and backlash from the Clarence Thomas-Anita Hill hearings. Like Langley, most of the holders of these so-called “widow’s succession” seats stayed in Congress for only a term or two. But some went on to distinguished careers on Capitol Hill. Margaret Chase Smith of Maine, for instance, won a special election in 1940 to fill the last seven months of her husband’s term. Smith went on to win four full House terms on her own, then was elected to four terms in the Senate, thereby becoming the first woman to serve in both chambers. Lindy Boggs, who was elected to her husband’s seat in 1973 after he was presumed killed in a plane crash, served nearly 18 years. She later was named U.S. ambassador to the Holy See. Six of the 14 women who served in the Senate before 1980 were either elected or appointed to fill their late husbands’ seats. Of those, only two (Hattie Caraway of Arkansas and Maurine Brown Neuberger of Oregon) subsequently won full terms in their own right. In the incoming Congress, women will make up a much bigger share of the Democratic than Republican caucuses. Women will account for 38% of all House Democrats and 36% of Senate Democrats, compared with 8% of House Republicans and 15% of Senate Republicans. Counting both chambers, there will be 108 Democratic women and 23 Republican women in the new Congress. Such Democratic dominance wasn’t always the case. Until the 1929 stock market crash, most of the dozen women elected to the House were Republicans, and for several decades afterward the two parties were generally close. But the gap widened in the 1970s and has persisted, despite a temporary narrowing during the Reagan-Bush 1980s. 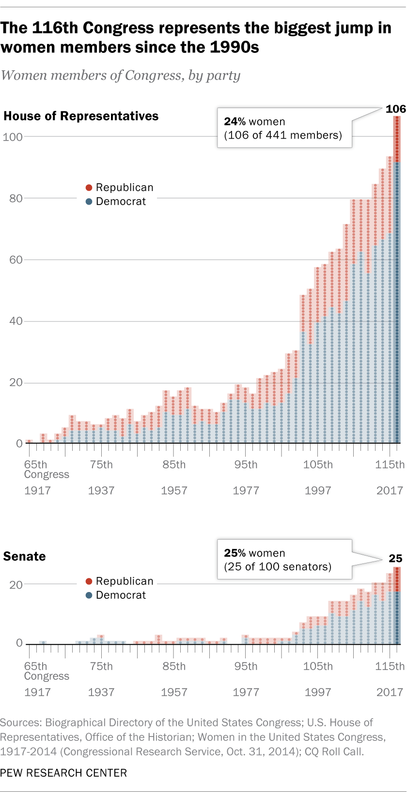 Of the 211 women elected to the House since 1990, 153 (73%) have been Democrats, as have 25 of the 36 women (69%) elected to the Senate over the same period. Just one of the 35 newly elected female House members, Carol Miller of West Virginia, is a Republican. Note: This is an update of a post originally published Jan. 14, 2015.